THE BEST OF "BREAK ON THROUGH"
Here are some articles that I wrote on my blog that I particularly like, so enjoy! Now, let's talk about something less serious… or not. Cyber-addiction is an addiction like any other, and sometimes it can be very serious. There surely different stages of addiction, because I kind of believe we are all cyber-addicts. I am a cyber-addict to some point: one of the first things I do in the morning is turn on my computer. And I spend an average of at least 3 hours a day on the Net. I think it's terrible of having that turn into a habit. 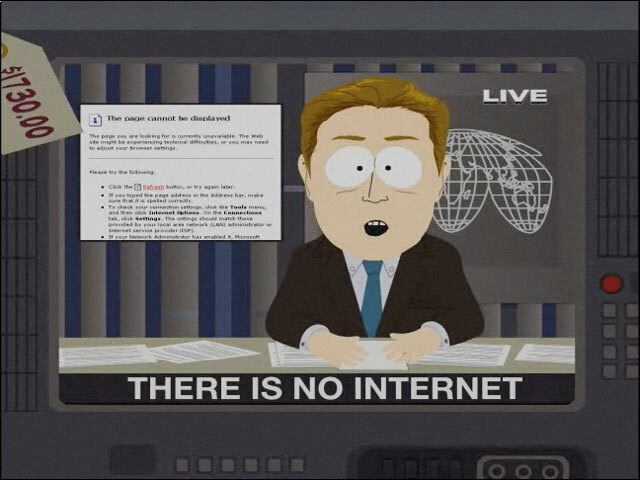 I keep on thinking about this South Park episode called Over-logging (that you can find HERE, some things are way over board, as usual with South Park, but the panic scene of the beginning is very realistic in my opinion…) when the Internet suddenly stops in the whole country and nobody can go back to their lives before the Internet. Somehow, I think about it and tell myself: what if it happened to us, what would we do? Crazy, yes, but scary too! Last Sunday, I went to the exposition China Gold at the Musée Maillol in Paris. It is a contemporary restropsective of around 40 Chinese artists. This exposition was really something, mostly because all the painting had something political about it, but also because each on of them was disturbing in some way. The political aspect was treated in every aspect, there were abstract painting of a fire hidden by thorns, or a picture of the last standing house in Beijing, where a new appartement complex was supposed to be build. It was both frightening and revealing at the same time, because it seems that it's never the Chinese that talk about their oppressive government, and for once here, they showed their revolt about this oppression. All arts were displayed: photographies, paintings, videos, there was even the picture of a happening back in China. I'd tell you to go see it, but the last day was last Sunday! Though, you can see some of the art on the following page. Softwares: to pay or not to pay… that is the question. On one side, there are open source softwares which everyone can get, and on the other side, there are the commercial software groups. Open Office and Firefox versus Microsoft and Safari. What advantages can one bring, what disadvantages? The wrong side of commercial softwares is that you have to pay for them, while open sources ones are free. But being free doesn't mean it is bad, does it? There is a paradox in the softwares I just named up above: I use Firefox and Microsoft, while I keep away from Safari and Open Office. And why is that? Firefox, though open sourced, is faster and gets updated more often than Safari. Safari is a Mac-users Internet navigator, and has the particularity of only posting the page once it has completely loaded. Which can be useful, though not for impatient people like me. I prefer seeing the page load one icon at a time rather than wait for a fully loaded page to appear at once. Silly, maybe, but an easy way to chose my favorite navigator: Firefox. Also, Firefox gets updated very often, while Safari doesn't, which keeps Firefox ahead at least in my mind. Open Office for me is only a pale copy of Microsoft, and I don't even have the latest version of Microsoft word. Microsoft is not that expensive (100 euros I think…?) and works really well, and, also, is compatible with everything, which is not the case for Open Office. Maybe I feel this way because I have first learned how to used word documents on Microsoft, and downgrading to Open Office confuses me (I don't understand half of the stuff). The match ends with 1 point for open source softwares, and 1 point for commercial ones… it seems like a tie!